Looking for Pressure Canner and Water Bath Canner Instruction Manuals (free downloads), Reviews, Prices and Support in 2019? Scroll down this page and follow the links. And if you bring home some fruit or vegetables and want to can, freeze, make jam, salsa or pickles, see this page for simple, reliable, illustrated canning, freezing or preserving directions. There are plenty of other related resources, click on the resources dropdown above. Pressure Canner Manuals: Download The Instruction Manual for Your Pressure Canner and Canning Equipment! Free Manuals, Instructions and Reviews! 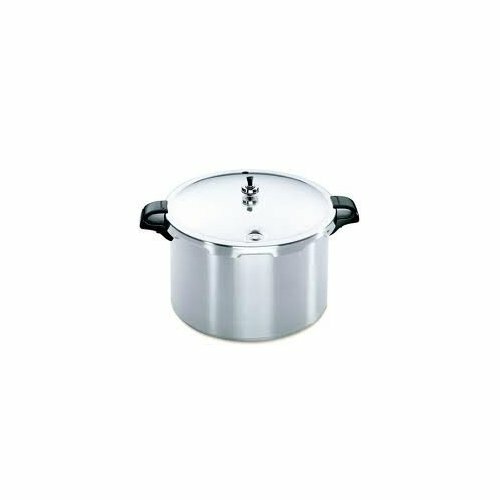 If you are looking for an pressure canner instruction manual or directions for your canner (water bath or pressure canner) and other canning equipment, or reviews and pricing to buy an canners and canning equipment, look no further. I have collected all of the manuals that I can find on this one web page (so far, All-American and Presto). Just choose your make and/or model and download the instruction manual for free. All you need to view or print the manuals is the free Adobe PDf viewer. And see this page for detailed step by step directions to pressure canning! It's a great quick reference guide for pressure canning! If you're looking for our illustrated jams, jellies, canned vegetables, fruits, salsas, applesauce, apple butter, green beans, etc., gelato, sorbet and frozen yogurt recipes, see this page! Note that the manufacturer urges you to read their precautions to use the equipment properly for safety. If they break the link again, just click here to write me and I'll email you a copy of the manual! These pressure canners are both a pressure canner and a pressure cooker, and with the weight off and lid left loose, can be used as a water bath canner, too. WINDOWS: right click on the link in the column to the right of the product name. From the menu that appears, select SAVE TARGET AS. MACINTOSH: hold down the OPTION key on your keyboard and click on the link in the column to the right of the product name. Here is the original official Mirro manual for all of their pressure canners and pressure cookers. 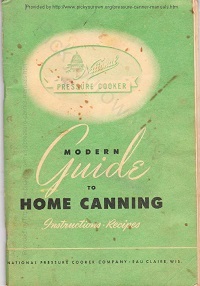 Click here for a link to a scanned older Mirro Pressure Canner manual on another website. If you have a Mirro pressure canner manual and can scan it, to make a better copy, please write me! Here it is! A visitor had a copy! As near as I can tell, this manual is generic to all of their pressure canners, including No. 5, No. 7, No. 12, etc. 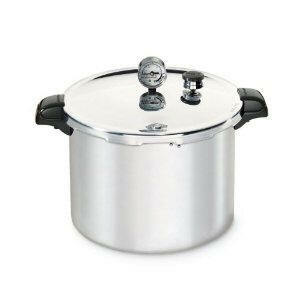 National Pressure Cooker is the company name (1917) for the Presto company. It became Presto in 1939. So, the National #7's date to the 1940's. The wood handled ones are older than the plastic handled ones. Using a canner that old is a but risky, unless you can have it tested and assuming you could get parts for it. So, if you replace worn parts, especially the over-pressure safety valve, you'll need to have the gauge tested or replaced and check the canner for warping or other deficiencies. The University of Idaho along with Washington and Oregon have these manual that works for any pressure canner! Using and Caring for Your Pressure Canner, PNW421, TPNWs (Pacific Northwest). Canners and Canning Equipment for Which We Are Still Seeking Manuals! Alcan Alumino Brasil SA A visitor writes on August 01, 2013: "I recently acquired a 12 qt (11.4lt)Alcan Aluminio Do Brasil SA pressure canner and I'm looking for the instruction manual. This particular model (which I think is 807) is UL Listed (5704) and thus was not subject to the recall. Can you help me track down a manual? If you have a copy of this manual, and can scan the manual to email me, please write me, and I'll add it!